in pattern worked in the rnd after blocking. Every fall and winter wardrobe needs a big squishy knitted cowl. This one has texture, softness, and can be worn many ways. It is reversible, with a different pattern on each side. Show off one side or the other, or both at the same time. Wrap it once or twice. The top and bottom edges match perfectly and this is achieved by using a provisional cast on, although any cast on technique could be used. 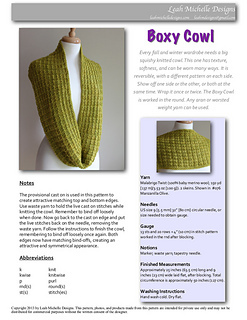 This easy pattern is worked in the round using only knit and purl stitches. Instructions are written and the pattern stitch is also charted. 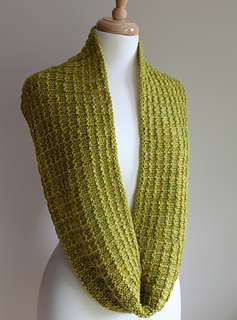 The pattern uses 2 skeins of Malabrigo Twist (300 yd), shown here in Manzanilla Olive. Finished measurements: Approximately 25 inches (63.5 cm) long and 9 inches (23 cm) wide laid flat, after blocking. Total circumference is approximately 50 inches (127 cm). Skills required: knitting in the round, provisional cast on, knit, purl. A great video for learning to do several different provisional cast on methods can be found here: Knitting Daily TV: Provisional Cast-ons.